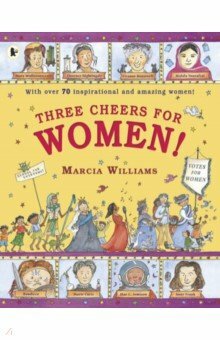 A celebration of inspirational women from all over the world and throughout history, told in Marcia Williams` much-loved comic-strip style. Join Marcia Williams as she celebrates incredible women from around the world and throughout history. From writers to warriors and astronauts to activists, discover their awesome stories and be amazed by their achievements. Featuring Cleopatra, Boudicca, Joan of Arc, Elizabeth I, Mary Wollstonecraft, Jane Austen, Florence Nightingale, Marie Curie, Eleanor Roosevelt, Amelia Earhart, Frida Kahlo, Wangari Maathai, Mae C. Jemison, Cathy Freeman and Malala, and packed with facts, quotes and jokes - hip, hip, hooray!